The Weekend of October 5th, 2018, Warren will be inducted into the International Video Game Hall of Fame in Ottumwa, Iowa. We look back at the Trading Card Spotlight interview I did with Warren on January 19th, 2018. 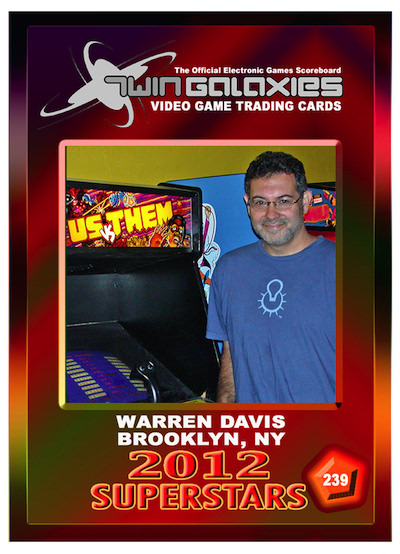 Our next Trading Card Spotlight features Warren Davis, who is displayed on card number 239, from the Superstars of 2012. The designer and programmer of Q*Bert, Warren has been around the gaming industry for decades. He has worked at such companies and Gottlieb, Williams/Bally/Midway, Disney Interactive and ILM. Other games Warren worked on are Us Vs. Them, Joust 2, T2: Judgement Day, and Revolution X to name a few. His video digitization system was used on many games including Mortal Kombat and NBA Jam. Warren is still marginally involved in the videogame industry today working with Sony on PS4 projects. His future projects will involve PSVR. Warren has also worked as an actor when not involved with gaming. He has been seen in such shows as House M.D. and Criminal Minds. What is your favorite game you have worked on in your career? I've enjoyed all of them in one way or another. I'm not very good at picking favorites. If I had to single one out it would probably be Us Vs. Them, because we were able to combine my love of video games and my love of filmmaking in a way that was unique and innovative for its time. 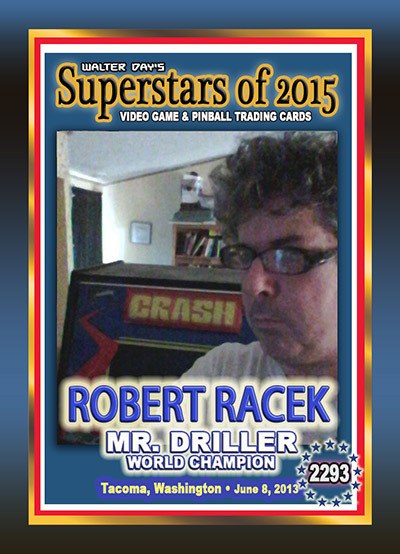 The Weekend of October 5th, 2018, Joel will be inducted into the International Video Game Hall of Fame in Ottumwa, Iowa. 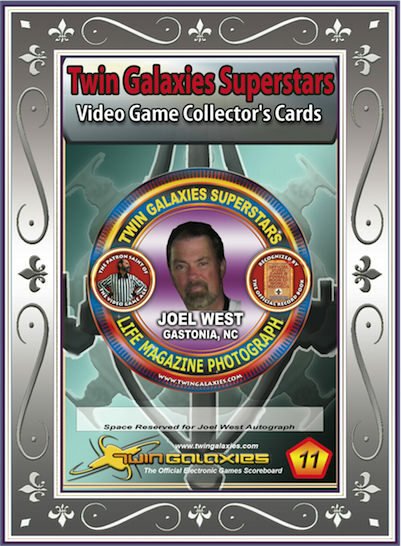 We look back at the Trading Card Spotlight interview I did with Joel on May 14th, 2016. Our next Trading Card Spotlight features Joel West, who is displayed on card number 11, from the Circus Card Collection of 2011. Joel is also featured on cards 1236, 1911, 2103, 2189 and 2197. Joel grew up in the early 1980’s when the arcade boom began. He was one of the original members of the famous TIME Life Magazine photo shoot in Ottumwa, IA outside the original Twin Galaxies arcade. The game he is most known for is Berzerk, where he holds a number of world records on both the Fast and Slow versions. In 2016, Joel is looking to break the marathon record on Frenzy (the sequel to Berzerk) with 100 hours of nonstop play on single quarter. You can see Joel in the documentary “Chasing Ghost: Beyond the Arcade” as well as in person at Walter Day events across the country. Oh so much! I learned how to spend money while standing in one spot for hours before internet shopping was invented. I learned there is no place too far to go to attend a competition. I learned all video gamers have superior hand-eye coordination and driving skills. I learned there is a cacophony of peoples from many different walks of life who love video games. While their paths may never cross in other areas of life; when they cross in an arcade, they easily make friends for life. The most important thing I learned is my life would not have been as rich if I had never dropped that first quarter and became a part of the gaming community. 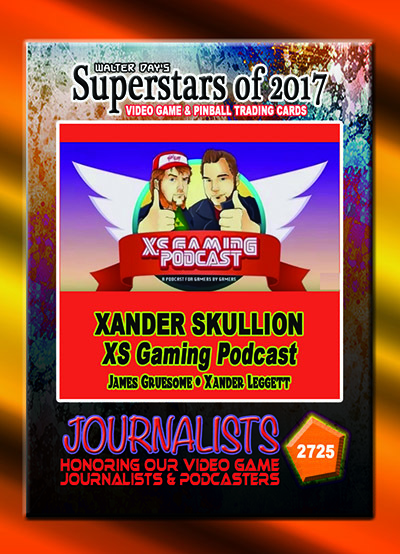 Our next Trading Card Spotlight features Xander Skullion who currently is displayed on card number 2725, from the Superstars of 2017 Collection. Xander is a full-time podcaster who loves the gaming community and gives back when ever he has a chance. Some of his time is reviewing video games for different companies. He loves the idea of getting contacted by gaming vendors and helping them. Xander is also a musician and movie lover. Oh man video game music is a huge part of my life. Other than playing video games I’m a musician. I play 4 different instruments. And that’s always been a dream of mine to compose video game music. I’ve some opportunities in the past with Indie titles but those went belly up. Who knows though maybe I’ll be the next Yuzo Koshiro (laughs) I mean we share the same birthday! This week we look back at an interview I did with author and Retro Gamer Jeffrey Wittenhagen. Jeffrey has written a handful of retro gaming books with stunning illustration. You can access these books for purchase as well as other items from Jeffrey at hagensalley.com. Along with Todd Friedman, Jeffrey is currently working on the Walter Day Trading Card Book, a detailed look at the first 200 cards in the collection. This interview was done on April 16th, 2016. I hope you enjoy. 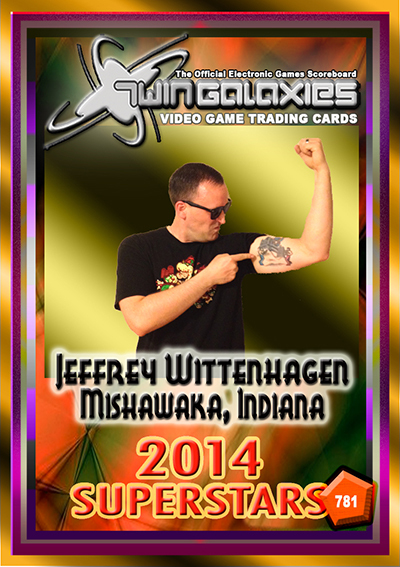 Our next Trading Card Spotlight features Jeffrey Wittenhagen, who is displayed on card number 781, from the Superstars of 2014 Collection. Jeffrey can also be seen on card numbers 1285 and 2288. Jeffrey is a published author of many gaming books such as Hidden Treasures: Rare & Unappreciated Gems and a NES collector’s guide called “The Complete NES”. He is currently working on a project to deliver the Super Nintendo Collector’s guide as well as publishing his own NES game called "Jeffrey Wittenhagen's Black Box Challenge". It is a Homebrew NES RPG, developed by Sly Dog Studios, where you collect video games, namely the first release black box NES games. I like the Game Boy Advance SP the most. It is essentially a portable SNES, with both 16-bit ports as well as new stylized games, which is one of my favorite eras of gaming. It was also one of the first backlit systems that also were rechargeable. With all the previous systems, the battery drain was insane and the main reason why they aren’t my favorite.